Rakefet Ziv-Li was born in Jerusalem in 1968 and lives in Kibbutz Rosh Hanikra in the Western Galilee. 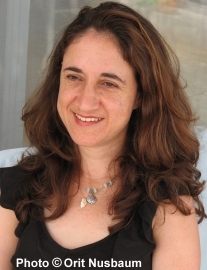 She studied musicology and psychology at Bar-Ilan University, and has an MA in Hebrew literature from Ben-Gurion University of the Negev, as well as a graduate degree in music therapy. She works as a music therapist for children and youth at risk. Ziv-Li has published a novel and a book for children. In 2005, she won the Haaretz Short Story Competition for her story "Rachamei Zion" ("Zion's Mercy").